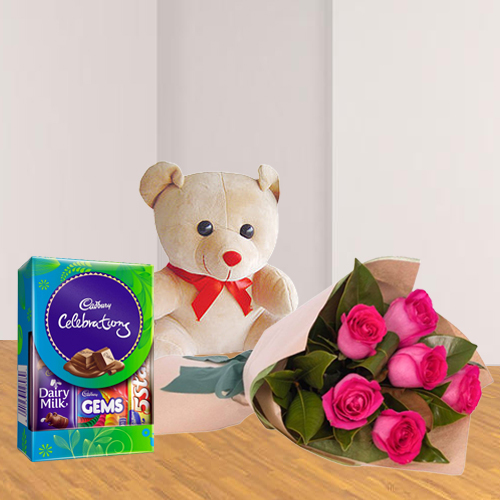 Moments turned out to be very special by ordering this Dazzling 6Pcs Pink Rose Hand Bunch, 6" Small Teddy with Mini Cadbury Celebration and make others feel happy. This Gift Hamper delivers an instant smile on the face of your dear one. Flowers Delivery Barrackpore, Send sweets Bilimora, Wedding Cake Chandigarh, Diwali Mithai Solapur, Send Flowers and Gifts to Vashi, Online Shop Buldhana, Flower to Haveri, New Year Flowers Sawai Madhopur , Fresh Fruits Jalandhar, Send Gift Karur, Dry Fruits to Indore, Birthday Delivery Valsad, Sending to Shimla, Flower shop Madurai, Guntur Online Cake Delivery.